Vienna – Holidays in Austria’s capital: accommodation and information. As the capital of Austria and most important city on the Blue Danube, Vienna has many faces. Although mostly famous for its coffeehouse culture and rich history, Vienna has plenty more to offer. In the summer the city tempts with beautiful beer gardens and wine taverns; in the winter Vienna’s museums and exhibitions make for great outings. Vienna has more attractions than you can shake a stick at. 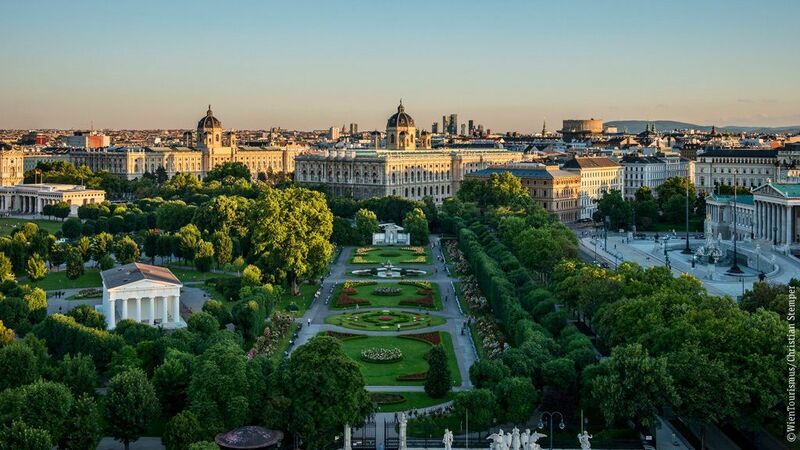 From St. Stephen’s Cathedral, Vienna’s landmark and Austria’s most important gothic building, to the Giant Ferries Wheel, from the Museum of Art History to the Albertina and the Museums Quartier: culture lovers will be delighted with the city’s offerings. Vienna is also a great place to combine sightseeing with shopping along Kärntner Straße and Mariahilfer Straße. Must-sees on every trip to Vienna are the Imperial Palace, Schönbrunn Palace and Belvedere Palace. The city’s magnificent buildings give a good sense of Vienna’s grandeur during the Habsburg rule. The Spanish Riding School enthralls audiences with its amazing horsemanship performances. Event highlights in Vienna include the Life Ball extravaganza and the world-famous Opera Ball. Vienna offers countless great accommodations. Browse Tiscover to find everything from luxurious hotels in the city center to cozy B&Bs and apartments on the outskirts. Art, culture and the city itself make a unique mix of tradition and modern times. And Vienna is also a great place to go shopping or just stroll around. In between many cafés and Heurigen inns invite you for a break on the shores of the Danube river. In summer Vienna shows ist best sides. Numerous sights are waiting to be visited. Classical music or clubbings - it mostly takes place outdoors. Film festival at the Rathaus square, Klangbogen music festival, dance festival and open-air cinemas : Vienna leaves no chance for boredom. From May on people go outdoors. "Schani" gardens in the city center, Heurigen inns with view of Vienna and outdoor sitting areas next to the Alte Donau river. Places like Copa Cagrana at the Danube river, the Summer Stage at the Danube Canal, the MuseumsQuartier in the city and the Bermuda Triangel - they all promise great entertainment. One of the 2003 highlights was the opening of the Albertina. In 2004 the Liechtenstein and the Sisi Museum opened their doors. And 2006 is dedicated to Austria´s most renowned composer, W.A. Mozart. Over 100 museums (e.g. Art History museum, Leopold Museum, Sigmund Freud Museum) offer excellent exhibitions. The best in theatre, opera and musical can be found here, too. Before and after it is time to enjoy excellent food in Vienna´s restaurants and cafés. And at night several exciting clubs and bars await you in the famed Bermuda Triangle area. Please mind the short stay parking zones in districts 1 - 9 and 20. There are several park&ride facilities offering excellent rates. * CAT (City Airport Train): direct connection from the airport to the center / Wien Mitte station in only 16 mins. Check-in for departure flights possible at Wien Mitte station. * rapid train S7 to "Wien Mitte station" every hour. * bus transfer to the Vienna International Center and to West and South Stations.